There are few footballers that can boast the goals-per-game record of Dave Mangnall, the cigarette-card star. The nomadic former miner who was born in Wigan and died in Cornwall, was nothing short of a frontline phenomenon, firing in one hundred and forty-one goals in two hundred and eighteen League appearances in a career which took him from Yorkshire, where he played for Doncaster Rovers, as an amateur, Leeds United and Huddersfield Town, to the Midlands, with Birmingham, then London, with West Ham United, Millwall and Queens Park Rangers, and there famously brought the friendship of American singer and film star Sophie Tucker, who became godmother to his son. Mangnall was neither the tallest nor heaviest player in the game, his vital statistics being five feet ten inches and eleven stone, but he was both quick and athletic and refused to be intimidated by bigger opponents. As well as being fearless in the air, he possessed a brilliantly deceptive body swerve which gave him room to shoot with both feet from a variety of angles. He started with Maltby New Church and Maltby Colliery. He had unsuccessful trials with Huddersfield Town and Rotherham County before joining Doncaster Rovers. After an unsuccessful stint at Doncaster in 1923-24, Mangnall collected coal during the week and goals on a Saturday for his local club Maltby Main. He was handed a second chance in senior football by Leeds in November 1927. He made a big impression for United’s lower league sides scoring ten goals in a Northern Midweek League game in which United trounced Stockport County 13-0 on 25th September 1929. Four days after his ten goal feat he was given his League debut. Mangnall made the headlines by notching six goals in nine outings, and much to the disgust of their supporters, Leeds parted company with him when top-flight rivals, Huddersfield Town, needing a replacement for George Brown, offered a then-hefty £3,000, in December 1929. 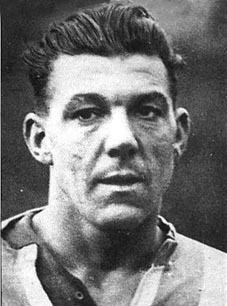 The Terriers, who had turned Mangnall down after he came on trial as a teenager, had his services from then until February 1934, when there were question marks over his recovery from an injury which had kept him out for most of the 1932-33 campaign, and he left Leeds Road for Birmingham. In the 1930-31 season he played for the Reserves team and they won the Central League Championship. The team scored nearly one hundred and twenty goals and over forty of them were scored by Mangnall, in just thirty appearances. He managed to establish himself in the first team during the 1931-32 season in which he set many club records. Unfortunately he suffered a serious injury in the 1932-33 season. He recovered sufficiently for the 1933-34 season, and managed to score ten goals in sixteen games, but questions about his recovery led to him moving to Birmingham City. While at Leeds Road he made seventy-nine League appearances and netted sixty-one goals. Mangnall’s later exploits showed those fitness fears to be unfounded, and he had similarly proved the doubters wrong earlier in his career. He chalked up seventy-three goals in ninety games in all competitions while at Town, with his best season undoubtedly being 1931-32. Mangnall can still boast three club records set during that campaign, the most goals scored in one season (forty-two), an individual five-goal haul (in a 6-0 top-flight home victory over Derby County on 21st November 1931) and the best-ever scoring run of eleven consecutive matches. Games two and three were against Oldham Athletic in the Third Round of the F.A. Cup with a 1-1 draw at Boundary Park, on 9th January 1932, when 30,607 crammed into a ground where the capacity is now just 13,500, being followed four days later by a Leeds Road replay when 20,609 watched Mangnall net four times in a 6-0 triumph. In all there were nine goals from the centre-forward in a cup run which also accounted for Queens Park Rangers, 5-0 on 23rd January 1932 and Preston North End, 4-0 on 13th February 1932 and took the Terriers to the quarter-finals, when, on 27th February 1932, a club-record attendance of 67,037 saw Arsenal win 1-0. Mangnall went one better in 1936-37, by which time he was playing for Millwall, who became the first club from outside the top two divisions to reach the Semi-Finals. Millwall's giant-killing feats owed a lot to Magnall's scoring ability as a procession of clubs came to The Den and were systematically put to the sword. He hammered four goals in a 6-1 First Round away win at Aldershot on 28th November 1936 and after that Millwall were drawn at home in every round. In the Second Round, on 12th December Gateshead leaked seven goals without reply, and then Second Division Fulham conceded two without reply in the Third Round on 16th January 1937. First Division Chelsea were the next visitors, in the Fourth Round afortnight later, and they fared worse than Fulham and went home defeated ignominiously by 3–0. Derby County, who had finished in second place in the First Division the previous season, were the next team to try to better the Third Division underdogs in the Fifth Round on 20th February, as a record crowd of 48,672 packed into The Den. They saw Magnall score first, and after the Rams had levelled the score, his co-striker McCartney scored the winner with just four minutes left on the clock. They were paired with Manchester City in the draw for the Sixth Round, once more at the Den, on 6th March 1937. The star-studded Maine Road side, which included goalkeeper Frank Swift, England internationals, Jackie Bray, Fred Tilson and Eric Brook, Scottish International Alec Herd, and the well-known Bobby Marshall and Ernie Toseland, who had all played in Ciy's 1934 F.A. Cup-winning side had been supplemented by the signing, for £10,000, of the brilliant Irish International, Peter Doherty. They had been undefeated in their last thirteen games and were unbackable favourites, but Magnall scored a goal in each half, with no reply from the Sky Blues for Millwall to become the first Third Division team in the history of the competition to reach the semi-final. As luck would have it, the ground designated for the last-four showdown with Sunderland was Magnall's old stamping ground of Leeds Road, Huddersfield. Mangnall, who used the services of a herbalist to beat a thigh strain, was urged on by both Millwall and Huddersfield followers in a 62,813 crowd. Almost inevitably, he was on the score sheet, and put Millwall into the lead, taking his cup-run tally to ten, but Millwall's dream run came to an end against Sunderland in that Semi-Final on 10th April 1937. Sunderland's star studded side, led by Raich Carter, were desperate to bring the cup back to Roker Park for the first time and that desire shone through as they used their greater ability to come back and win 2-1. There was some consolation for Magnall's Millwall as they won promotion to the Second Division the following season. After achieving a remarkable scoring average with Huddersfield, he continued this while at St Andrew’s where he scored a further fourteen goals in thirty-seven League appearances. This included a hat-trick against Liverpool at Anfield on 13th October 1934, but he also set another record by scoring ten goals, the highest ever by a player in the Central League competition, and ironically it was scored against another of his former clubs. Leeds United, in 1934. Having joined the Blues in February 1934 he went to West Ham United in March 1935, where he replaced Vic Watson, and again was extremely prolific, scoring twenty-nine times in just thirty-five League appearances and also added another one in two F.A. Cup appearances, before joining Millwall in the summer of 1936 for £1,000. He led their attack when the Lions reached the FA Cup Semi-Finals and won the Third Division South Championship the following year. The success marked an acrimonious end to Mangnall's time at the Den as he demanded a wage rise and the club refused him. He amassed thirty-two League goals in fifty-eight appearances. He dropped out of football for a short while and ran a cafe and grocery business in the midlands at Sutton Coldfield. But, on 16th May 1939, just before the outbreak of the second World War, he joined Queens Park Rangers as a player. However, the war resulted in him not playing for Rangers, other than in the three games in the 1939-40 season, in which he managed three goals, but the Football League later erased all record of the aborted season. He did, however, play with them for most of the War years as well as guest for Millwall and several other clubs when he was the member of the Civil Defence. His record for Queens Park Rangers in the war years was very impressive and in 1939-40 he scored thirty-five goals in forty appearances, in 1940-41 he scored twenty three goals in twenty four games, as well as nine goals in eight games in the War Cup. In 1941-42 he scored twelve times in twenty-eight games, in 1942-43 there were eleven in twenty-five, the three in eighteen appearances in 1943-44 and one game without scoring in 1945-46. He also turned out for Southend United once in 1939-40 but did not score, while he repeated the feat for Fulham in 1943-44, but a return to his old club Millwall in 1942-43 saw him score in his only game. On 29th April 1944 he was offered the player-manager role at Rangers. Although initially reluctant to take it on, he finally did so, and built a team that won the Third Division South championship in the 1947–48 season, to give Queens Park Rangers their first-ever promotion. After four tough seasons in the Second Division they were relegated back to the Third Division, where they were to remain for fifteen seasons before Alec Stock led them to promotion again. After relegation in 1951–52, Mangnall left the club and never managed in the Football League again. In June 1952 he was replaced by Jack Taylor, who later bacame manager at Leeds United. During his managerial career at Queens Park Rangers from April 1944 until May 1952 he managed the team through two hundred and eighty games, of which they won one hundred and twelve, lost ninety-four and drew seventy-four. He became a publican in Penzance, where he was had the Navy Inn on Queen Street. It was there that an illness ended a remarkable life at the age of just fifty-six, when he died on 10th April 1962.